I recently discovered that two singles were released from the John Otway / Europeans album 'All Balls & No Willy', namely 'In Dreams' and 'Mass Communication.' I managed to get hold of them, and on the b-Side of 'In Dreams', I was surprised to find a 'cover' version of the old 'Bachman-Turner-Overdrive' track 'You Ain't Seen Nothing Yet'. The vocal is delivered in Otway's own unique comic style, and Colin Woore gets to play a few decent lead breaks. The 7" states that this track is 'otherwise unavailable'. A shame that it wasn't dug out for the CD reissue ! This next one is particularly exciting, as it contains a Europeans track unavailable anywhere else! 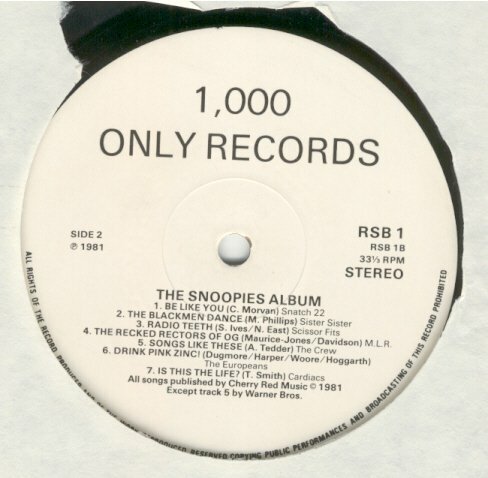 The source in an LP called 'The Snoopies Album.' 'Snoopies' was an alternative music venue in Richmond (London) that closed its doors in 1981. As a 'celebration' of the venue, the promoter there gave the wonderfully named 'Ralph.E.Boy' unrestricted access to the demo tapes of bands that had played there. Ralph picked 15 of the best tracks for a compilation album, and privately pressed 1000 copies on to vinyl. Other bands included on the compliation include 'The Cardiacs', 'The Scissor Fits' & 'The Tronics'. 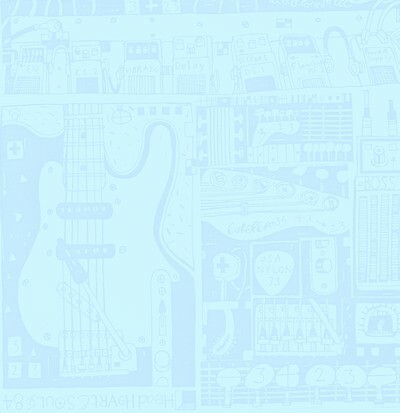 Track 6 on Side Two is called 'Drink Pink Zink!' by Europeans. It is listed as a 4 track recording, published by Cherry Red Music. (Steve's surname is mis-spelt as 'Hoggarth.') The track itself has a 'sca' / 'two tone' feel to it, and sounds instrumentally a lot like the Otway album tracks. There is a short section towards the end, with droning chords that reminds me of the middle eight to 'American People.' It ends with an off-the-wall 'anti' piano solo! 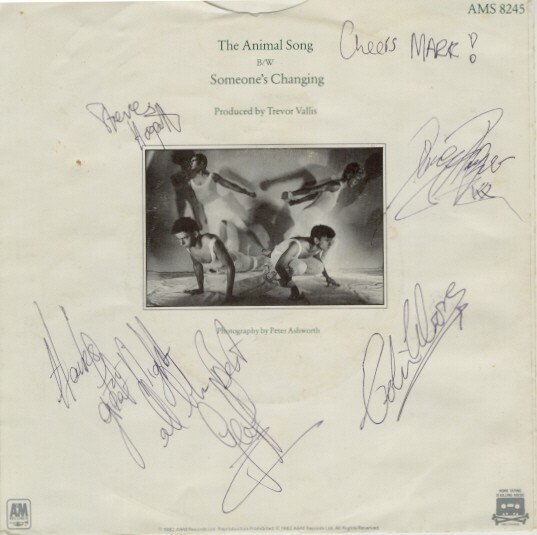 I also managed to get hold of a UK 7" single of 'The Animal Song', fully signed by the band back in 1982 ! I don't know where it originates from, but it is signed 'Cheers Mark' at the top by Ferg Harper, and 'Thanks for a great night' by Geoff Dugmore ! These How We Live demo tracks were sent to me by a fan that used to help roadie for the band. (Steve apparently gave him a copy of the tape back in the 80s) They are labelled 'demos', but they are very 'polished' and not that different to the final versions on the 'Dry Land' album. 'We Don't Need to Be Lovers' is a previously unheard track, unmistakeably HWL, with great vocals from Steve. 'Simon's Car' and 'You Don't Need Anyone' have since been added on to the Racket Re-Issue of 'Dry Land', although the tracks here are the 12" versions that were recently available for download exclusively from the Marillion Fan Club site.